George Butterworth, perhaps the most famous British composer lost in World War I considered himself as much a folk dancer and collector as a composer. In this podcast based on the composer's diary, we follow George on a Morris dance hunting expedition in Oxfordshire in April 1912. This podcast is based on GB/10 Volume 10: Diary of Morris Dance Hunting deposited in the Vaughan Williams Memorial Library at Cecil Sharpe House in London, and available online as part of the excellent Full English project. 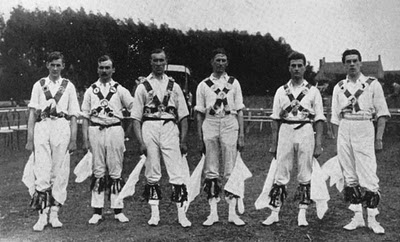 Cecil Sharp's demonstration morris side of 1911 (Left to right: D.N. Kennedy, George Butterworth, James Patterson, Perceval Lucas, A. Claud Wright and George Jerrard Wilkinson. George Butterworth's 1909 wax cylinder recording of David Clements (C37/1631) and many other unique folk recordings are available from the British Library's Ethnographic wax cylinders collection.